I am 27 years old Nigerian entrepreneur. I believe in God and I use his Grace more often. I am motivated by the 1999 constitution of the Federal Republic of Nigeria Chapter 2 Section 24(d) “it shall be the duty of every citizen to make positive and useful contribution to the advancement, progress and well-being of the community where he resides”. I’m the president of House of Bubbles Innovations an organisation set up for business, leadership and personal development through trainings, seminars and other interactive sessions, which has empowered over 200 budding entrepreneurs at the Obafemi Awolowo University ile-ife at its annual entrepreneurs summit tagged “ONE STEP CLOSER” by networking, Business Grants, Business Partnership and books on entrepreneurship to all participant. I am also the founder of “Young entrepreneurs” a forum where young people with innovative and creative minds in Nigeria to learn what it takes to become successful entrepreneurs. 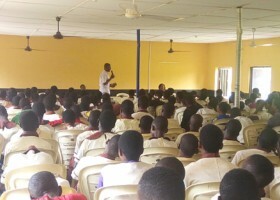 Where we provide a framework for the development and assessment of entrepreneurial attributes, behaviour, skills and capabilities which altogether lead to the development of entrepreneurial attributes which has began across secondary schools in Nigeria beginning from the state of Osun. I am a practising entrepreneur; the business owner of Bubbles laundry and services a fast growing SME in the heart of ile-ife Osun state, a business he founded five years ago. I am a co presenter on Entrepreneurs Corner on crown 101.5FM, a programme based on START UP, GROWING AND EXPANDING your business.